This section is intended as an introduction to part one of my new work The Biggest Wake Up Call in History which will soon be available as an eBook and in hard copy. It contains an image gallery, related resources and a number of relevant links. I will add to, and modify, it over time. There can be few places that demonstrate the widespread impacts and flow-on effects of humanity’s careless uses of its world than the oceans. 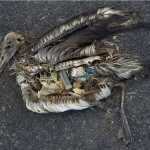 Here, far away from human settlements, other creatures are paying a heavy price for the expansion of the human population, the continued pursuit of economic growth and the resulting worldwide tide of waste. Of the many images that could have chosen to illustrate this, here are two that show the impact of the ubiquitous uses of plastic. The first is a Shearwater chick from Lord Howe Island, off the east coast of Australia. Shards of plastic can be seen within the rib cage. 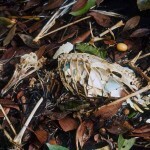 The second is of an Albatross chick on Midway Island in the Pacific. A cigarette lighter, bottle tops and other refuse can clearly be seen. It is a shocking image. It’s worth visiting Chris Jordan’s website to view other images of this kind taken as recently as 2009 and 2010. 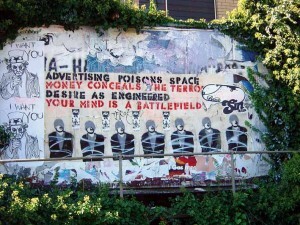 Underneath are seven stencilled figures with open mouths and tightly bound arms. With most of their heads obscured by some sort of covering they are reminiscent of the atrocities at Abu Ghraib in Iraq. A mere fifteen words and a few simple images convey a message that evokes a torrent of questions about the nature of our reality and the power of those who want to persuade us that ‘retail therapy’ is good for us. This is a rare piece of ‘raw truth’ that challenges us to respond. This image will be a familiar sight to many, especially those who live in flats or apartments. 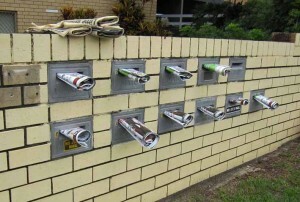 It shows ten mailboxes outside such a building in Brisbane. All but one are stuffed full of the latest round of advertising garbage that universally clogs up mailboxes even when, as here, some people have tried to hold back the flood by putting No Junk Mail notices underneath. The underlying message is that the interests behind this flood of unwanted rubbish will use every means possible to flog the latest stuff whether we want it or not, whether it makes sense or not. Hints of a possible solution are, however, beginning to emerge. In a piece in the Guardian Weekly* on ‘alternatives to ecofascism’ Micah White suggests that ‘humanity can avert climate catastrophe without accepting ecological tyranny.’ To do so requires ‘an immediate, drastic reduction in our consumption.’ Silencing the incessant commercial mantra to ‘buy’ that drives the whole crazy process can, White argues, be achieved through what he calls ‘three synergetic campaigns.’ These are listed as: ‘the criminalisation of advertising, the revocation of corporate power and the downshifting of the global economy.’ Odds anyone? *White, M. Alternative needed to ecofascism, Guardian Weekly, 24th September, 2010, p. 20. One of the many consequences of rampant commercialism is the way it has misdirected entire populations away from understanding and fulfilling their authentic needs. Instead the market projects a vast array of baubles that largely disappoint because they only tend to offer substitutes. To be constantly dissatisfied, however, means that one can be a ‘good consumer’ returning often to purchase further doses of temporary relief from the stress and pain of the ‘skin-encapsulated ego’ in the desert of contemporary life. This is one way that ‘demand’ is maintained – but at immeasurable cost. The consequences for young people in particular have been severe. They include the marginalisation of more helpful values, the sexualisation of young children and the rise of radical individualism. 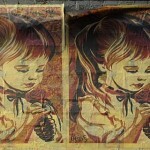 The two images shown here were taken on different sides of the world and yet are closely related. 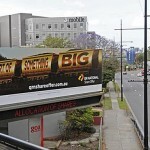 One is of a young man in a German city in angry denial of the social context that makes his existence possible; the other is a deliberately ironic ad from Australia. They are visual clues to the sense of negativity, lack of meaning and violated agency that so many young people continue to struggle with all around the world. Surely we can do better than this. 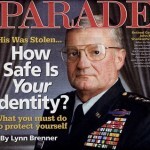 In retrospect it is very clear that Carter was on the right track. He also knew that the warnings he articulated and the issues he raised would be widely resisted. Yet he held to an ethically informed course of action. It was no surprise that his attempt to ‘tell the truth’ as he saw it also meant saying farewell to any chance of re-election. As history shows, the American people preferred their illusions over and above the chance to recognise a more demanding reality so they elected a ‘B’ movie actor who offered them the reassurance they preferred. The cracks in the ‘American way of life’ that were already visible were papered over. Now they’ve have become chasms and, as Greer and others have pointed out, the full costs involved are spiralling beyond control. 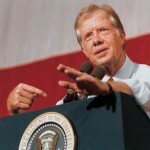 Who said that ‘we get the politicians we deserve’ or that ‘man (people) cannot bear much reality?’ The timely foresight that Carter sought to encourage and support was deliberately ignored so that the ‘party’ could continue unabated. 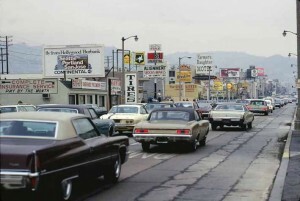 This image was taken in Los Angeles back in 1971. Here the multiple effects of an over-commercialised culture were already clearly evident. The traffic is backed up along a much-repaired street. The forest of signs lacks any appeal and blocks out the landscape, as does the pall of smog hanging over everything. This is a poisonous environment in more than one sense and, as such, a warning that the costs of modernity were, even then, spiralling out beyond all reasonable limits. 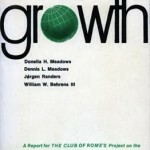 But the warnings that were clearly expressed in the Limits to Growth project (published around the same time) were widely dismissed or ignored. 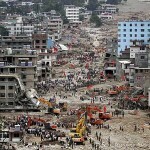 So were countless other warning signs and signals of distress in the global environment. This was not, and is not, viable. Long term, it means that the chickens come home to roost and the eventual mess is that much more difficult, if not impossible, to resolve. Social learning through recurrent crises is not an effective strategy. New technology is often presented as a solution to some sort of ‘problem.’ But in recent times early expectations are frustrated as experience shows how it often creates more difficulties than it solves. Think of missile ‘defences,’ pesticides, asbestos and cheap oil for a start (let alone nuclear energy – see below – and so-called ‘clean’ coal). Edward Tenner explored this issue in his book Why Things Bite Back (London, Fourth Estate, 1996). He argued that for every significant advance there was what he called a corresponding ‘revenge effect.’ New technology demands more human care to function well, not less. 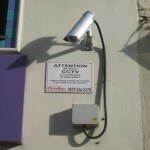 It therefore tends to increase the need for vigilance, which also comes with a price attached. Yet for every major problem allegedly ‘solved’ another often springs up in its place. As technologies become more complex and penetrate ever deeper into the social world such concerns will increase. 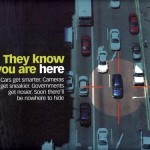 Examples illustrated here are: identity theft, body scans at airports (and, in time, elsewhere), CCTV cameras in every city street and remote tracking of vehicles – just to catch crooks, of course. In the book I suggested that to allow an ‘adolescent’ species such as ourselves access to nuclear technology was comparable to providing teenagers with grenades. Imagine my surprise, therefore, when, on a recent trip to Melbourne, I found the two illustrations reproduced here. 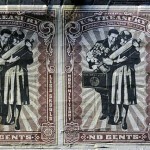 Both skillfully employ homely images juxtaposed with military hardware to draw attention to the contradictions involved. Once again, the most penetrating insights can be found on the street, if you know where to look! 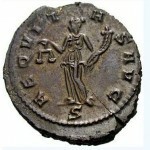 The view of a settled and productive Earth can be traced back, in part, through the history of Cornucopia, or the ‘horn of plenty.’ It can be found on Roman coins such as the example here from the third century B.C.E. A Seventeenth Century version was painted by Jacob Jordaens, student of the great Rubens. 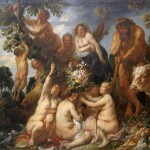 Like Rubens himself, he often set well-fed human forms in a faux-natural setting, with trees, animals, fruit and so on representing the productivity of the Earth and that of human beings. 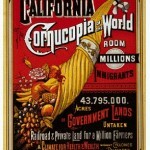 The third image shows this ancient myth re-animated to attract colonists to California in the Nineteenth Century. 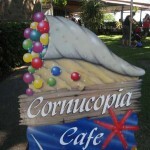 Finally, a degraded version of cornucopian plenty can still be found today in the name of a café in Darwin, Australia. Overall, the presence of such myths deep in the collective subconscious helps to explain why we find it so hard to come to terms with the fact that the Earth actually has real limits that we are currently transgressing at our peril. 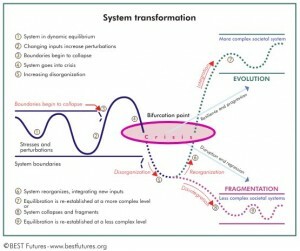 We’ll very soon have to collectively set aside such notions if we are to manage the complex transition from ‘growth’ to a world in which humanity lives in balance with its life support system. 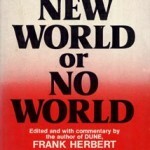 A similar type of hubris can be seen in those places where human beings have employed the temporary subsidy provided by ‘cheap’ fossil fuels (that is, fuels whose long term social and environmental costs have never been factored into market prices) to impose their will on extreme desert landscapes. The two examples I discuss in BWCH are Las Vegas and Dubai. A combination of hubris, ‘cheap’ energy and technological prowess have made it possible to erect monuments to human power and dominance in these places. You really have to visit them to understand this Faustian bargain. Both feed off of value and worldview commitments that are questionable to say the least. They project cornucopian myths that I believe are way past their ‘use by’ date and they aggressively display a misplaced confidence in the ability of human works to prevail over the forces of nature. Yet to know anything of the history of these places and the cataclysms that created them over millennia is to begin to expose the fallacies involved. In our rush to ‘conquer the world’ and expand without limit we’ve conveniently set aside the folk knowledge of past history and the contemporary meaning of disasters that so often fell upon our forebears. This is not, however, about religion, ‘punishment for sins’, divine retribution or the like. It’s about our inability to see when that when we confront forces greater than us in these ways we can only ever be the eventual loses. Respect for natural forces is not a ‘green myth’ but a necessary component of a future civilisation that seeks to live in balance with nature. 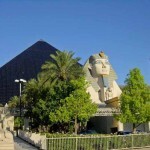 Las Vegas and Dubai still promote themselves as desirable places, especially for holidays. But they are best seen as carry-overs from the past that need to be retrofitted for a different era or simply avoided. Chapter three takes a careful look at the notion of ‘overshoot and collapse’ and asks – is it is credible? It draws on a number of sources, three of which are shown here. 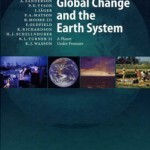 The book Global Change and the Earth System edited by Will Steffen and others helps us to ‘connect the dots’ as it were and to begin to understand how the Earth system is changing and why. 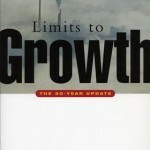 The 30-year update of the Limits to Growth provides an authoritative perspective on how this project has developed over that time. It also up-dates insights that are crucial to our ability to ‘get a handle’ on current trends. Yet the book was widely ignored by mainstream media. 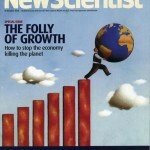 New Scientist, however, is a credible source that is worth watching. It is occasionally prepared to ‘think the unthinkable’ and question taken-for-granted notions of growth that lie at the heart of our predicament. In this section I’ve reproduced a few of the figures from the book. (They are used with permission. My thanks to Best Futures.) 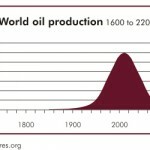 The first depicts world economic growth from 1900 to 2050; the second the rise and fall of oil production from 1600 to 2200. While greatly simplified these figures depict the stark reality of two structural features of our time. Global carrying capacity appears to have been exceeded some thirty years ago. Furthermore, the further extension of the growth trajectory looks set to multiply levels of consumption by as much as 400% in a period of about 40 years. 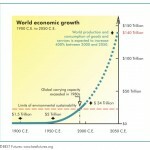 To call this unsustainable is something of an understatement. The second figure is equally dramatic. By remaining beholden to an entrepreneurial culture that remains in denial of limits, we are failing to invest in the transition from fossil fuels to sustainable sources of energy. The essence of this transition, however, is not technical. Part two of The Biggest Wake Up Call in History, goes into some detail about other aspects that have been widely overlooked – namely, worldviews, values and a variety of personal and social developmental options. 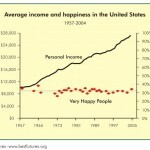 One of the clues to the primacy of these ‘interior’ factors lies in the meaning of the third figure that depicts the relationship between income (black line) and happiness (line of red diamonds). What it shows is that once income reaches a certain level, happiness does not increase by much at all. In fact it seems fairly static. 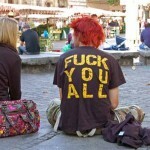 It’s an obvious point – affluence per se, is a dead end so far as human satisfaction is concerned. It has been over-sold as a primary goal of social existence. It follows that we could do without such high levels of affluence without necessarily suffering much at all. So we could decide to re-think just what affluence is, does and means, as well as the growing costs of maintaining it at current levels. 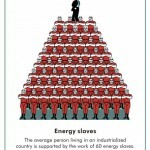 A further point of clarity is reached when we acknowledge the range and extent of the ‘energy slaves’ (mainly derived from the temporary subsidies provided by fossil fuels) that we’ve come to rely upon for nearly everything. Sixty of these ‘slaves’ per person in industrialised nations is excessive and we are on notice that the current situation cannot last. The final figure reproduced here hints at an issue that has been widely overlooked – at least in the research, literature and mainstream debates about ‘global challenges’ that I examined for this work. 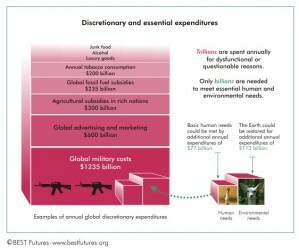 It suggests that ‘trillions (of dollars) are spent annually for dysfunctional or questionable reasons’ while ‘only billions are needed to meet essential human and environmental needs.’ Why is there such a stark mismatch between such needs and what are essentially negative or counterproductive expenditures? It’s as if invisible forces were, in some way, operating in the background to produce these perverse outcomes. the ‘fantasy economy’ of financial speculation. All three are touched on in a couple of sources that I found useful in penetrating into these often murky activities – Misha Glenny’s Mc Mafia (2009) and Roberto Saviano’s Gomorrah (2008) along with the documentary film of the same name. While the former covers a number of case studies around the world, the latter focuses on the way that criminal networks have undermined civil society in southern Italy over several decades. The human, social and environmental results are devastating and have long-term effects and implications. Bringing such threatening and dysfunctional issues out into the open is a dangerous occupation requiring nerves of steel and an overarching commitment to justice. They are essential steps toward a better understanding of how certain interior values and impulses powerfully affect us now and, in effect, foreclose a variety of options for the future. 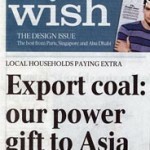 There can be few issues that demonstrate long term costs of current practical, perceptual and political time lags than those associated with continuing to mine, export and burn coal in a tangibly warming world. I only refer to this briefly in the book but the issue deserves a closer look. As a kid growing up in the UK I was used to coal being delivered by truck to our neighbourhood in sturdy bags carried upon the shoulders of hardy men who worked year round in all types of weather. I occasionally helped my father mix the residual coal dust in the cellar to make briquettes. These kept the fire in all night, enabling it to be re-stoked next morning. From a 1950s terraced house in Portsmouth central heating seemed a distant prospect. Increasing concerns about air quality led to the introduction of Clean Air Acts and coal was widely phased out in favour of gas – so far so good. But nothing prepared me for what would later occur in Australia and a small number of other places. I guess few people anticipated the hyper-industrialisation of coal at the very time when its drawbacks had become crystal clear. ‘over its lifetime…a single (coal fired) power plant should be assigned responsibility for exterminating about four hundred species’ (P. 239). 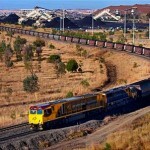 In late 2010 we are witness to an extraordinary attempt by the Queensland Government to sell off the rail freight network that is responsible for transporting truly enormous amounts of coal from the inland open cut mines to the coast. This is being presented as a great investment opportunity, the buzz line of which is ‘be part of something big.’ How ironic those words really are for few appear to have any inkling of the wider implications. Local communities are up in arms about losing valuable farmland and other local impacts such as denuded towns, pervasive health effects and pollution. But, beyond this, there’s been no outcry and hardly any comment at all about the nature of the transactions currently under way. 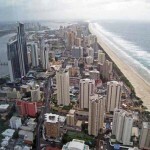 Queensland’s Continuing Carbon Addiction, presentation by Guy Pearse, University of Queensland, Brisbane, 28th October, 2010. [i] Pearse, G. Land of the Long Black Cloud, The Monthly, pp. 20-25, September, 2010. 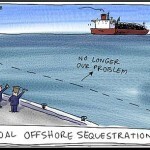 Also see Pearse, G. King Coal, The Monthly, pp. 20-26, May, 2010. This provocative film uses the device of a lone survivor, played by Pete Postlethwaite (left) in a remote, computer-equipped archive somewhere in the Arctic, reviewing material from several different locations around the world during the early 21st Century. The film tracks various climate related changes in these places as experienced by various people. One of the most telling segments is the journey of an English family to the French Alps where an elderly local guide takes them to visit a glacier he’s known for most of his life. Whereas once it was possible to walk straight out onto the glacier, now visitors must climb down extensive iron ladders set into the rock to reach the ice. Another depicts a young African woman in the Niger Delta whose life has been disrupted by rebels and oil pollution, yet who aspires to being a doctor. To clean the fish she’s caught she uses soap powder to get rid of the scum of oil. About a dozen such threads are woven together to present a tapestry of insight into a world on the edge of catastrophe. Various images are used to portray the latter. 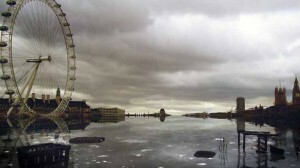 For example, the one below portrays the London’s Eye and Houses of Parliament, among other structures, isolated by rising sea levels. But this is far from being merely another disaster movie. The film asks why we did not act when we could have done so. And whether at heart we believed our civilisation was worth saving. Taken on its own this provocative film – and the ‘Indie screening’ distribution method adopted for it – would make it interesting enough. But what makes it particularly worthy of consideration here, and what may well qualify it as a fine example of ‘social foresight in action’ is the range of spin-off activities it has generated. These include the Not Stupid and the 10:10 campaigns (10% reduction in personal CO2 emissions in 2010). Both bear watching as, post-Copenhagen, the world struggles to respond to rising CO2 emissions and a corresponding resurgence of denial. 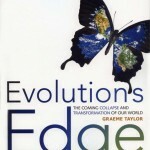 Having completed this survey that attempts to understand the ‘nature of the problem’ facing us, part two of the Biggest Wake Up Call in History deals with ‘the search for solutions.’ After examining a number of strategies and proposals, it identifies an emerging narrative that shifts our focus from ‘collapse’ to ‘descent,’ It also canvases new options for human and social development that, along with appropriate technologies, provide qualitatively different ways to deal with the increasingly threatened, and threatening, futures before us. My hope is that readers will emerge with a sense of qualified optimism along with a renewed sense of energy, purpose and direction. The near-term future could so easily turn into an end game for humanity. Alternatively, it could lead us into new territory, personally, socially and in relation to the wider world that is our home.